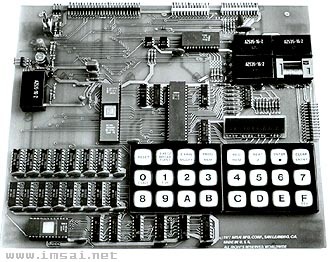 A soon as the Intel single chip microcomputer was available, IMSAI developped this single board computer. The 8048 processor offered integrated RAM, ROM, I/O, Timer/counter and interrupts. IMSAI added a 24 keys hexadecimal keyboard, a 9-digit LED hex display, 26 I/O lines connectors, 5 relays, Teletype and audio cassette interfaces. 2 Kb of ROM and 1 Kb. of RAM was intalled. Sockets was available for one additional Kb. The system was expandable up to 64 Kb. of RAM off board. The 8048 board was intended for computers newcomers particularly interested in interfacing techniques. Thanks to Thomas Fischer and his IMSAI site for the pictures and some information. POWER SUPPLY 5V. external P.S.U. PERIPHERALS RAM expansion up to 64 Kb. see more IMSAI 8048 Ebay auctions !